The Board of Directors of Mississippi Action for Community Education, Incorporated, along with the staff and all our volunteers wish to thank everyone who attended the 41st Annual Mississippi Delta Blues & Heritage Festival. We appreciate your support and we look forward to seeing you on September 21, 2019 for the 42nd Annual Mississippi Delta Blues & Heritage Festival. The purpose of the Annual Mississippi Delta Blues and Heritage Festival is to reach a worldwide audience with a celebration of the contributions the Mississippi Delta Blues culture has made to the American story - and to help preserve that culture. Mississippi Delta Blues is globally recognized as one of America's most important musical forms. A major catalyst for American popular culture, it exists in both a folk context and as a product of the commercial music industry. In the face of a historically brutal social experience, Black folk in America affirmed their humanity by remembering and creating a rich expressive culture of poetry, tales, crafts, ritual, dance and music. This system embodied techniques of cultural transmission, transformation, adaptation and survival. Early Blues developed out of this rich fabric and cross-fertilized the work-songs, love-songs, slow drags, rags and spirituals. Delta Blues soon became the emotional and literary voice of Black singers across the South. Ironically, Black and poor people from the Mississippi Delta, who gave the world the Blues, had limited access to traditional or contemporary institutional arts and cultural programming. The products of most rural peoples' art are inaccessible to them. They are housed in urban academic institutions and archives. They need to be preserved and showcased to larger general audiences as the legacy of a living culture. While this art form was being celebrated internationally, the Delta region was still one of the poorest regions in the country. In 1976, Mississippi Action for Community Education, Incorporated (MACE) saw the need to help create financing for educational programs and gave birth to the "Delta Blues & Heritage Festival". The success of the "Delta Blues & Heritage Festival" spurred the creation of festivals all over the Mississippi Delta and beyond. Please visit the Sponsor's Page to see our Sponsors for the 41st Annual Mississippi Delta Blues & Heritage Festival. Please click here to download the Vendor Application. 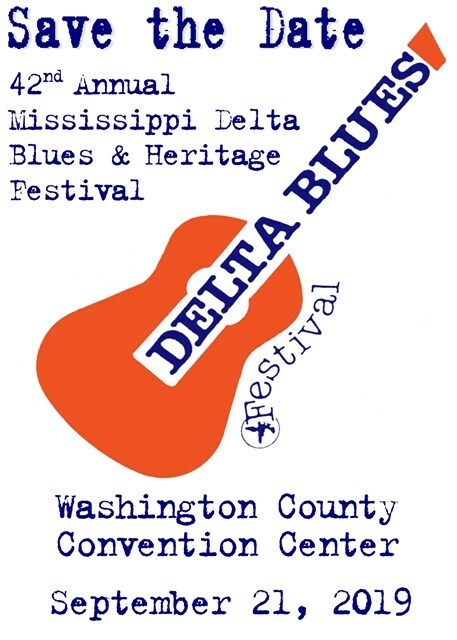 Mississippi Action For Community Education, Incorporated (MACE), a Mississippi non-profit organization, announces a design contest to select the graphics used as the 40th Annual Mississippi Delta Blues & Heritage Festival Poster and T-shirt design. Please click here to download Poster Contest Rules and Application. If you have questions regarding the Blues Festival, please visit the "Contact Us" page for more information. For daily updates please click on the "Latest News" link at the top of the Menu Bar.